Yvette Mattern is a video artist and filmmaker whose work intersects the disciplines of performance, cinema, and avant-garde opera. Her most recent project, Global Rainbow, is a spectacular, large scale outdoor laser projection consisting of seven beams of laser light, each beam representing one color from the seven color rainbow spectrum. 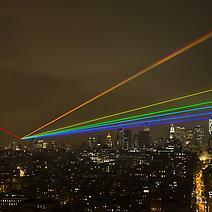 Mattern’s intention is to project Global Rainbow across large open sights, specifically in densely populated areas. With her projection, Mattern hopes to encompass geographical and social diversity in its reach, and to symbolize hope. Mattern’s work has been exhibited, screened, and performed at various institutions such as White Box, New York; The Berlin Film Festival, Germany; Sternersen Museum, Oslo; The Contemporary Arts Museum, Houston, TX; and Riga National Opera House, Latvia.